Get tips by reading on! Start with a clean template sheet. Put in all your tasks. 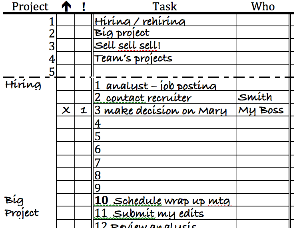 Use the left bar to group thematically by project (such as "Hiring" and "Big Project"). If you depend on someone else, write their name or initials on the right end of the task. Use stars, codes, or X's to identify urgency under the !. Indicate where you need input from leadership under the ↑ symbol, so you can have more productive meetings. 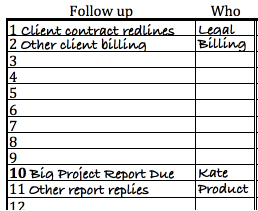 There is also space to mark down top-level projects above your task list. Mark down all your follow-ups, grouped thematically. While potentially numerous, these should need less detail, as you're just checking in with others on their status. These follow-ups may ping-pong back and forth into the task column, as the ball ends up back in your court. Enter your focus goals for the week either based on deadlines or on what's piled up in your task queue. It should now be clear from your week's goals what you should prioritize by day. Use numbers or highlighting to draw attention. Carry this with you, keep it front-and center, and mark any new work right in with everything else. "I'm getting a lot of mileage from this" - D. K.
"Very concise and useful." -I. R.